Hamilton & District Aquarium Society – Celebrating 60 years of the hobby! I would like to take this opportunity to thank everyone for nominating me as your new President of Hamilton and District Aquarium Society. This position is an honour and I will try my best to keep the club strong and growing with new members and having more youth involved in this great hobby. At this time I like to thank Carla MacDonald for her dedication towards the H&DAS for the past few years. Carla will be still helping the club much as she can. Your 2019 Hamilton & District Aquarium Society Executives! I hope everyone enjoyed January’s program that I presented. Working in Retail in the hobby.What I go through on a daily basis. Our speaker this month knows what I go through because he has been there too ! It’s our friend Frank Aguirre! Frank will be presenting Technical Information Part 1, covering repairing and resealing aquariums, air pumps for fish rooms, plumbing for water pumps, and water purification. This years Home Show is coming a very fast! Be sure to sign up via email* or in person by the end of the February meeting on Thursday the 14th. All participants will receive a prize. We also need volunteers to help us out as runners. There will be a sign up sheet at this months meeting. Yes……Finally! Ponds are open and all my fish survived. Woohoo! It’s May and that means “CAOAC Convention” May 18 to 20 at the Burlington Holiday Inn. It’s not too late to purchase your ticket. Lots of great speakers, lots of specialty classes, vendors, auctions and lots of fish friends coming together. Big huge thank you to everyone that entered the H&DAS Home Show. You all had beautiful tanks! Special thanks to Frank, Peter and Charlie for judging the tanks and Jessica for taking such beautiful pictures and video. Our May program will be presented by Haydn Pounder about his many experiences with the wonderful world of Show Guppies. Haydn will be bringing gorgeous show guppies from his private stock as well as a selection of plants. Tommy Lam from “Shrimp Fever” will be our presenter in June, speaking on freshwater shrimps. The Peel Club (PRAC) is hosting a dinner speaker on a Saturday, June 9th with Rachel O’Leary. Be sure to get your tickets before they sell out, Rachel is a speaker you don’t want to miss! Jessica will be taking orders for our new club t-shirts at the May meeting for pick up at the June meeting. T-shirts range in size from Men’s Small to 4XL in Fruit of the Loom 100% cotton. They are $10; all orders must be paid in advance. The executive is inviting you to a club BBQ on Sunday June 24. Sign up sheet and info at will be available at our meeting this Thursday, May 10th. We look forward to seeing you all at the meeting on Thursday. As a reminder, you can come to a meeting without being a member. Come check us out! Well we made it to March – in like a lion so hopefully out like a lamb. A great Big Thank you to Peter DeSouza for his presentation at our last meeting. Always a pleasure. Our March presentation will be on Arowanas by Oscar. I’m looking forward to this. How many of you keep Arowanas? There is still time to sign up for the April Home Show. The HS team of judges includes Peter, Charlie, and Frank, with Jessica as photographer. They would like to visit all entries before our Spring Show and Auction. I know you are all excited about the Spring Show and Auction on Saturday, March 24th at the Waterdown Legion. Doors will open at 8am, the auction will start at 10am. The show and auction are open to everyone, you need not be a club member to participate. If you can possibly help out by running bags of fish, setting up tables, writing chits etc please let us know what time works best. We truly appreciate all our volunteers and sponsors. The CAOAC Convention is quickly approaching, May 18 through 20 at the Burlington Holiday Inn. Tickets can be purchased online through their website. First off – a great big huge thank you to Jessica, Peter and Albert for all your hard work and dedication as part of our executive team through the last several years. Our 2018 team includes Mike M., Steve F. and Patricia M. I’m excited to be working together with this group bringing you programs that help to inform you and various experts you can gain experience from. Thank you Frank Aguirre for your Biotope Program. Please reach out to Frank if you are interested in competing at the 2nd Annual Canadian Biotope Competition at the CAOAC Convention May 18 through 20. It’s sure to be a great weekend. Please check the CAOAC site for information (www.caoac.ca). Our Spring Auction and Show is on Saturday March 24th at the Waterdown Legion. Doors open at 8am, auction begins at 10am. We are looking for help in all areas of the auction from runners to chit writers. Please let me know if we can count on you (president@hdas.ca). Have you signed up to show off your tank at the Home Show? The HS team will be visiting you in March to take some pictures and video of your tank. Big or small, salt or fresh, we would really like to see your tank! Everyone showing their tank will receive a prize for participating, a People’s Choice Award will be given as well. Good Luck everyone! Our December Holiday meeting had a really great turn out with over 50 members in attendance. It looked like everyone was enjoying the “Fish Jeopardy” program by Noel. Thank you so much Noel for another amazing Christmas game. We raised $330 and 200 pounds of grocery items for Neighbour to Neighbour! Our January speaker is Frank Aguirre with his Biotope program. He will be helping us to prepare for the 2nd Biotope Competition at the CAOAC Convention May 18 to 20. We will also be announcing the new executive at our meeting. If you’d like to be involved in helping with club activities, monthly programs, auctions, and shows please come out to an executive meeting or share your ideas with me at meeting. Our Spring Auction and Show is coming up quickly on Saturday, March 24th at the Waterdown Legion. Please save the date to come help our the club for a few hours. Every extra set of hands is really important. Have you signed up the the Home Show in April? We would like to come out and see your tanks. Let our team of experienced hobbyists come out and capture the beauty of your tank. Lots of prizes and of course bragging rights. First, a big thank you to our friend Terry Seufert for his presentation ‘I Want That Fish!’ at our last meeting. I want that fish, too! The holidays are quickly approaching and so is the big event. Our annual Christmas Party is on Thursday, December 14th, starting at 7:30pm. We ask that everyone bring a donation for our Neighbour to Neighbour Food Drive. Sarah is putting together a Fish Raffle table with all proceeds going to N to N as well. Please contribute if you can; items do not need to be fish related. We will be serving pizza and wings – desserts are always welcome! Our Club elections will be taking place at our January meeting. Are you interested in helping out the club? Do you have some ideas that can benefit H&DAS? All positions (president, 1st vice, 2nd vice, secretary, treasurer) are open. We welcome your ideas! Please contact me if you are interested. 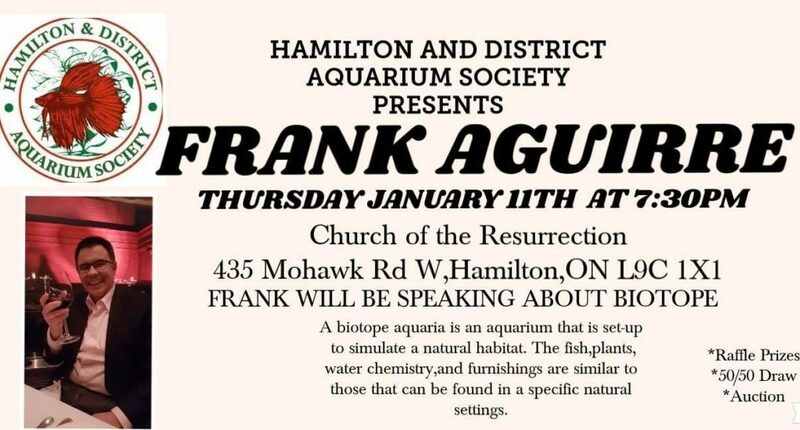 Our January speaker will be Frank Aguirre with his “Biotope” presentation. Our Spring Auction & Show is on Saturday March 24th at the Waterdown Legion so please mark that in your calendar as well. I’d like to wish everyone at H&DAS a Very Merry Christmas and Happy New Year. Thank you Larry for your presentation on Lake Malawi. Our presenter on Thursday November 9th is Randy Seufert. His topic “I want that fish” sounds really fun. As a person who enjoys looking at different tanks and loving fish I can often hear myself saying just that! At our meeting on Thursday please remember to bring your $5 if you signed up for the Fish Growing Contest. The amazing Koi Swords are from our very own Charlie Drew’s stock. This should be an exciting competition with several prizes to be won. Will your fish be bigger than mine? Next month we celebrate the Holiday Season with some games and treats. We will have a Neighbour to Neighbour Food Drive. We ask that everyone help out with this. Sarah is setting up a raffle table with all monies raised supporting N2N. If you’d like to bring a dessert please let us know, that would be amazing. Pizza and wings will be provided. January is election month. All positions are open. If you are interested please come see me or message me. Thanks so much. Hope to see you on Thursday. What a great season Fall has been this year. I’m sure many of you with ponds are starting to get ready to protect your fish this winter. I know that’s my plan. I hope everyone is enjoying the many Fall auctions. Our auction was a great success. Thank you to everyone that came out to the auction and a huge thank you to everyone that volunteered a portion of their day to help our club out. The Kitchener-Waterloo auction is on October 22, St Catherines October 29, and Peel November 5. The Durham Club is celebrating their 50th Anniversary with a speaker dinner on October 14. More information is on the CAOAC site. Our speaker this Thursday October 12 is Larry Johnson presenting his Malawi Safari 2016. You can sign up for the fish growing contest at the meeting as well. Charlie Drew will be providing beautiful Koi Swordtails for the contest. (5 for $5). Happy Thanksgiving to you all! Hope to see you Thursday.